I'm like the Sahara - I have dry skin, a dry body and dry hair! Actually, my hair isn't just dry, it's also frizzy! It used to be quite damaged through illness, colouring, heated tools etc but after a few years of intensive treatments and regular cuts, I wouldn't describe it as damaged anymore. I'm very strict about using heat protectors and don't use heated tools daily - generally I use them twice weekly these days. That being said, unless you saw my hair when it's wet and knotty (if it's anyone other than my regular hairdresser combing my hair, I apologise for the knottiness in advance! ), you wouldn't really think that it was dry and frizzy because the products I use, keep it looking healthy and I want to share those with you today! L'Occitane Intensive Repair Shampoo: This silicone-free shampoo contains essential oils, amino acids and provitamin B5, to strengthen and repair the hair. It leaves my hair feeling really soft and smooth (I almost feel that I could skip conditioner, which is unheard of for me). It also smells amazing due to the essential oils of lavender, ylang ylang, geranium, sweet orange and angelica. A little goes a long way with this shampoo and while it lathers well, it doesn't strip my hair at all. It is definitely one of my favourite haircare discoveries that I made last year! 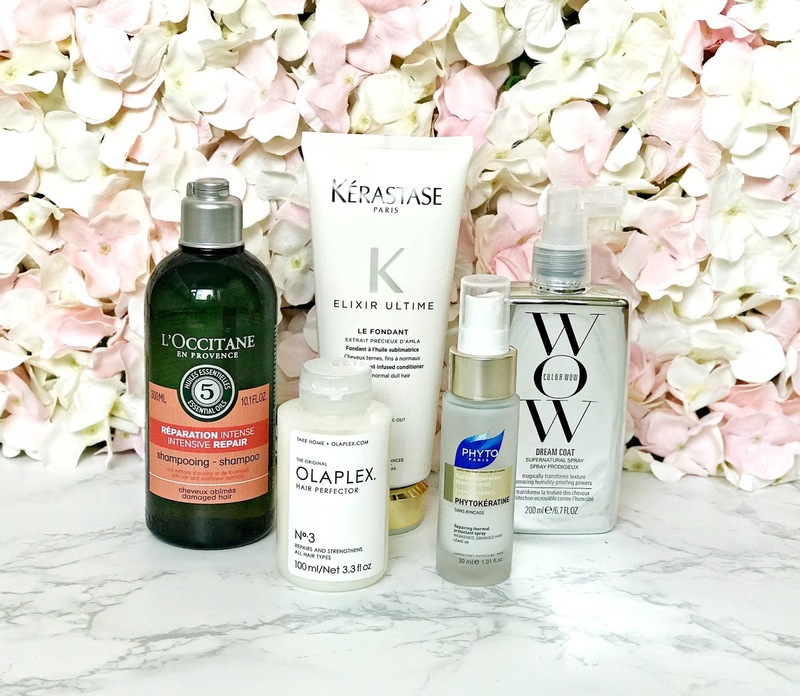 Kérastase Elixir Ultime Conditioner: I've had a long-term love affair with Kérastase products - for a good 10 years, it was the only brand that I used and recently fell back in love with it when I purchased this conditioner. It nourishes my hair without leaving it feeling heavy and because it is oil-infused, it really helps to manage my frizz. It also smells amazing, as all Kérastase products do! Phyto Phytokeratine Repairing Thermal Protectant Hair Spray: This protector also works well as a detangler so I use it twice weekly when I wash my hair. It contains hyaluronic acid, ceramides, botanical keratin and Yun Zhi Extract, all of which combine to protect and nourish the hair. It's extremely lightweight so it really doesn't feel like there is any product in the hair, which I love because I have fine hair but a lot of it so I don't like my hair to be weighed down by products. Colour Wow Dream Coat Supernatural Spray: I've been using this product for around 6/7 months so I'm not sure why I haven't mentioned it on the blog before! Once I have detangled my hair, I section it and then spray this in from just below my roots to my tips. It doesn't need to be used after every wash, the suggested use is every 2-3 shampoos. It contains a heat-activated polymer that seals the hair strand to protect it, which also reduces frizz. It leaves hair feeling really smooth and pretty much gives a salon-like finish. What I love is that I don't feel like I have product in my hair and there is no build up or greasiness with it. If you aren't keen on hair oils or find them too greasy, then this is the product for you! Olaplex No. 3 Hair Perfector: Once weekly, I dampen my hair and smother it in this and then leave it for as long as possible (sometimes I put it in first thing in the morning and wash out at night, other times, it might be a quick 10-15 minute job!) before rinsing. This is a pre-wash treatment, which replaces the need for a traditional mask - perfect if you have fine hair or hair that gets greasy quickly after using an intense hair mask. This is a little bottle of magic! It leaves hair looking healthy, bouncy and glossy and feeling nourished and strong. The bottle is small but you actually don't need a huge amount of it and as a once weekly treatment, it will last quite a while - depending on the length of your hair! Have you tried any of these products? I'd love to hear what you use to battle the frizz? All products are bought by me, unless otherwise stated. The L'Occitane shampoo and Phyto spray were kindly sent to me. Opinion is always my own. Affiliate links may be used.